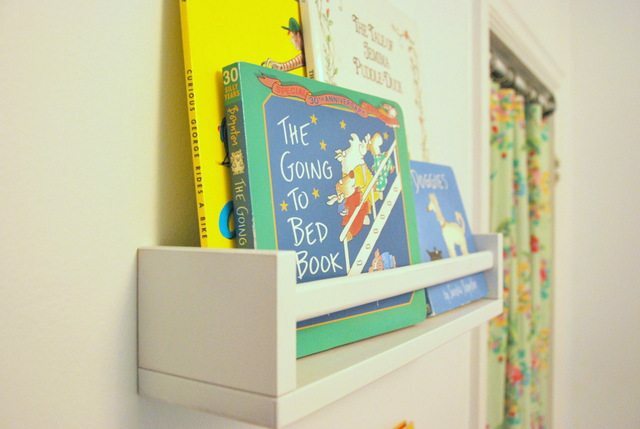 Even though we had finished our nursery makeover before Maya arrived in August, there was one project that remained on the to-do list: using IKEA spice racks for books. 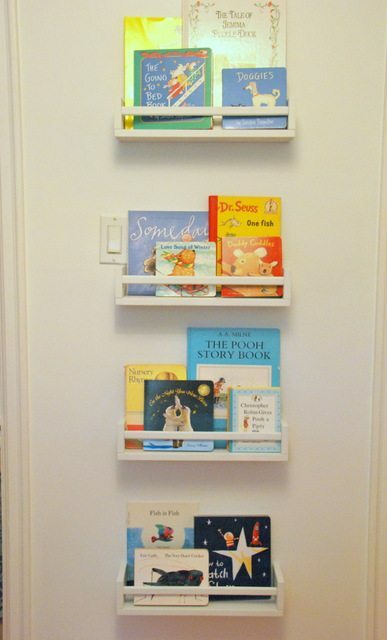 We wanted to create outward facing book storage on a small sliver of wall we had in the room. 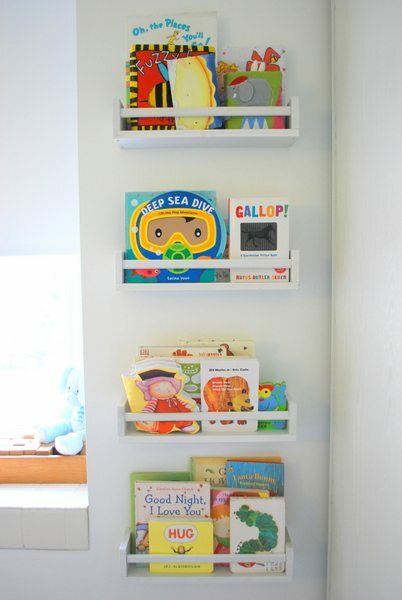 When I helped decorate my friends’ nursery last year (check it out here), we used IKEA spice racks for books and I loved the way they came out. Easy to assemble and paint, and it’s nice to have the books facing outwards. Cute, right? Links have been included for your convenience. Some may be affiliate. Please see my full Policies page for more information. This white spray paint, but they have a bunch of colours you can choose from (and even a few different white options)! 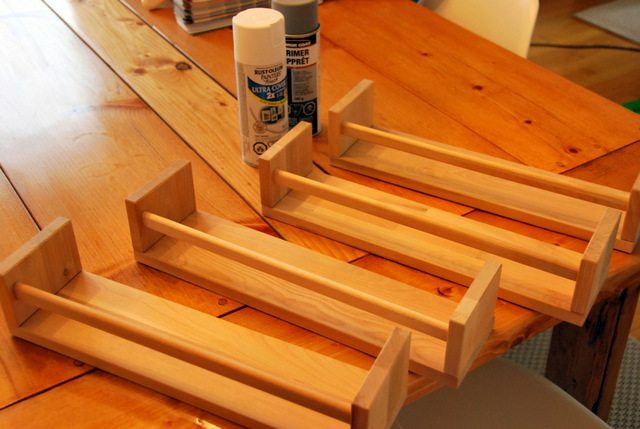 Assemble your spice racks and then start off with a few coats of your primer. I find this raw wood from IKEA really soaks in the paint. Once I started applying the white spray paint, I did a light sand between coats with a fine grit sanding sponge to get the racks more smooth. This really helped give them a polished look and kept them super soft to the touch (good for little fingers and hands!). 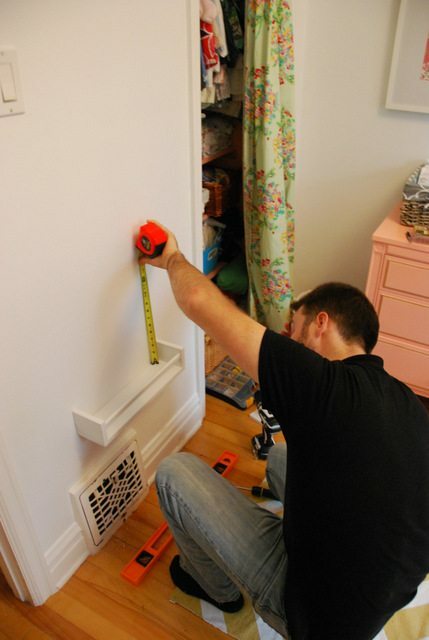 The back is all ready to be mounted to the wall, but you need to have your own mounting hardware. We used one of Maya’s bigger board books as a guide for how much space we wanted between the shelves (14 inches). We centered the shelves on the wall, and placed them so that they would be low enough for Maya to grab at when she’s a bit bigger. The light switch was in a weird spot, but I didn’t want the shelves to be off-centered on the wall, so we just made sure that the switch would come between two of the shelves and still be easily accessible. Then I popped in some of little miss Maya’s books – all ready to go for bedtime stories. Sorry about the bad lighting in these photos. It was overcast here this weekend (we even got our first snowfall! ), so not much natural light coming in from the window. 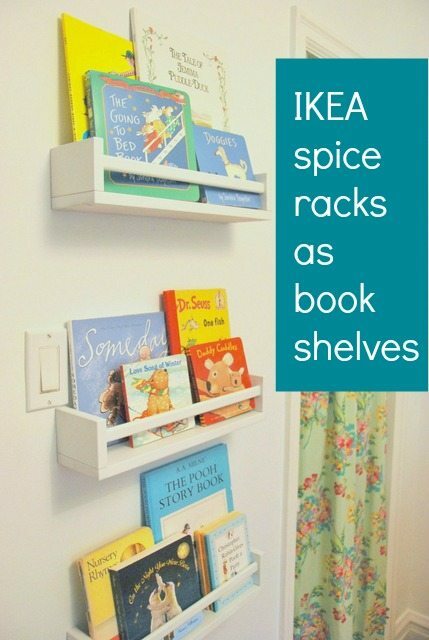 The design of the spice rack really is perfect for holding books up. I kept it to 4-5 books per shelf, but there is still plenty of space to add a few more books per shelf if I decide to. It’s so nice to have some of the books out of our big basket and up on the wall. If we had a really huge room, I would have loved to do bookshelves across a whole wall. Dreams! 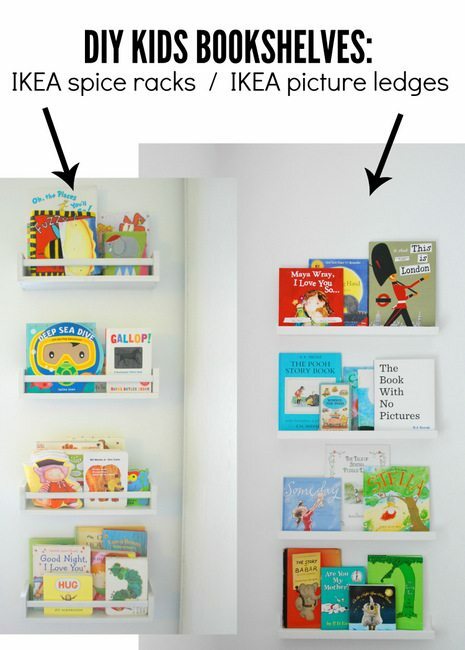 I have since also used IKEA’s Ribba picture ledges for outward bookshelves in kids rooms, and have done a comparison of the two products over in this post. 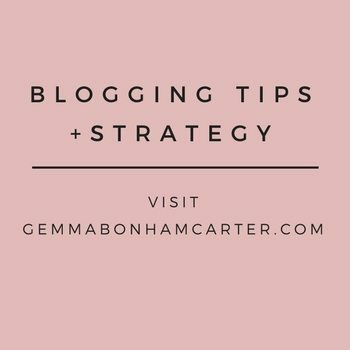 Be sure to have a read! Which do you think came out on top? 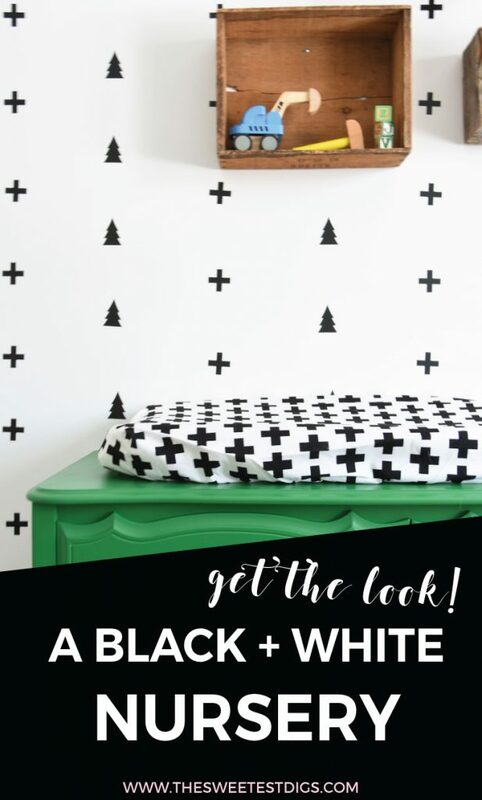 If you are looking for more kids room decorating ideas, be sure to head over to Maya’s mint and pink nursery. There are a whole bunch of DIY projects in that room that came out so sweet! 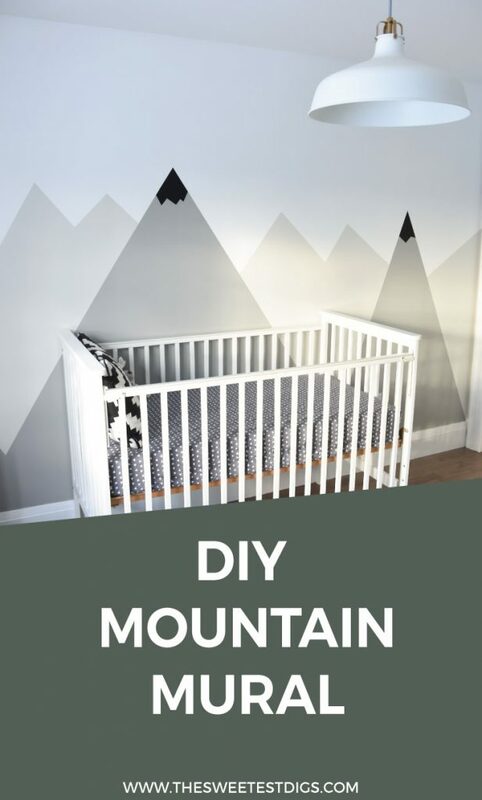 And James’s scandinavian slash camping themed room is all kinds of modern and fun with a DIY mountain mural and more. The full before and after is here. Have you guys done this spice-rack-as-shelves trick? Do you display lots of books in your home? Got any fave children’s books? You KNOW what MY favourite children’s book is! ;) Looks great Gem. That’s awesome. My plan was to do the exact same thing on our wall between the door and closet. We just move at a lot slower pace than you. Our shelves are sitting on the radiator ;o) I like your idea of using spice racks. Oh gosh – can’t remember now as this project was several years ago. So sorry Jamie! Best of luck. Oooh fun idea! Would they be big enough to hold magazines? That would be great! Love it!! We love love love books in this family! Léa is so crazy about books.. she always goes to bed with one or two.. they are all tucked in with her between a teddy bear and a baby doll! 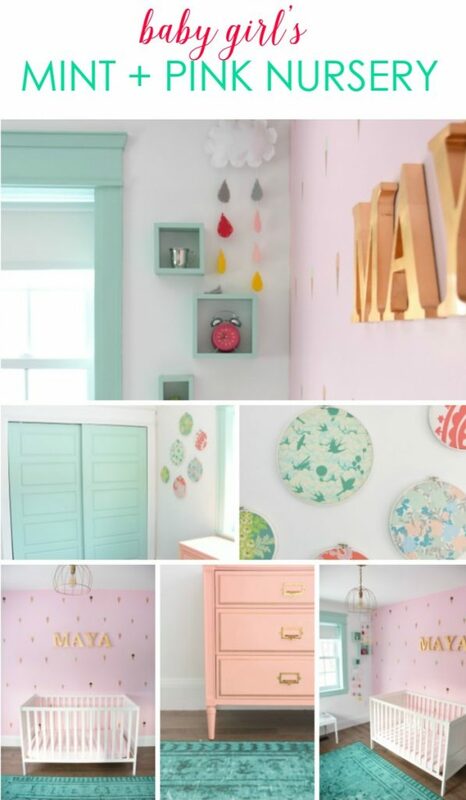 I wanted to do something like that for her new room, but ended up recycling a old IKEA Expedit bookshelf (its white… but I just found out IKEA came out with a hot pink and a turquoise versions.. bummer!! haha!) it holds a lot more books… so we were able to move her collection of books from the living room to her bed room (to make space for baby toys!). I’ll keep the spice rack idea for little Miss 2’s big room in a few years! Oh and as for favorite books.. Léa really really likes the “Splat the Cat” books.. you should check them out if you don’t know about them already.. I personally love the cat illustrations.. they look so fuzzy!!! Yeah it was really the perfect little nook. Thanks Jitka! 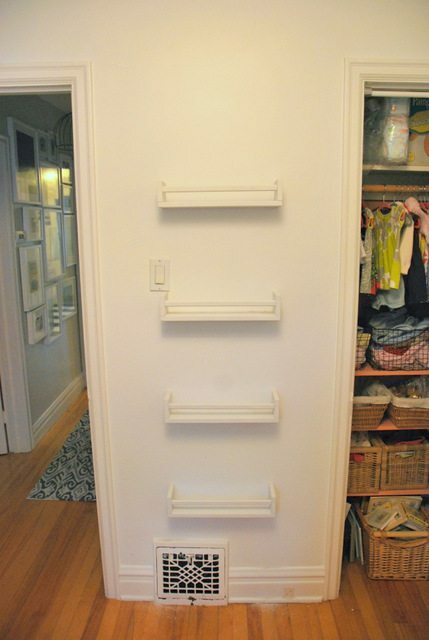 This is a great organizing idea! Our kids book storage is a terrible mess! 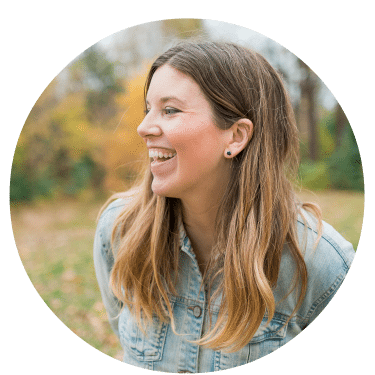 It’s super easy to do (and budget friendly) – I totally recommend it! I love this idea. I’m currently decorating our nursery for our baby girl due in January and I’ve been wanting to do something similar. Now I just need to figure out if I’ve got a big enough wall space. Amazing! Congratulations on your upcoming little bundle…!! This is adorable. 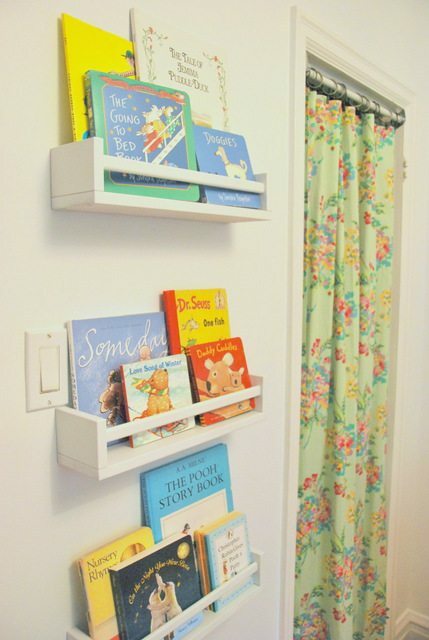 I read another blog where the mama did this same thing and she said they had to use the metal butterfly brackets so the racks were sturdy enough to hold heavier books (like board books). Can I ask what your experience is with this? How did you guys hang the racks and do they seem to be sturdy enough? 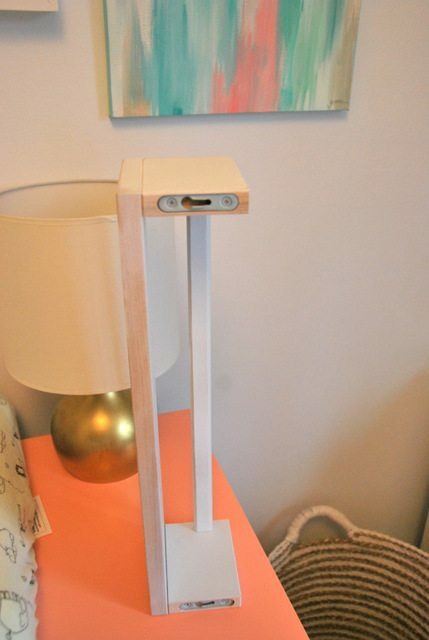 Thanks so much for sharing your project with us step by step! Good question, Allisa! We didn’t use metal butterfly brackets (would have been overkill for us), but we did use our own, sturdy, drywall anchors. I can’t remember if there were any anchors that came with them from IKEA, but we also use other ones from the hardware store (we like the ones from Rona, in Canada). 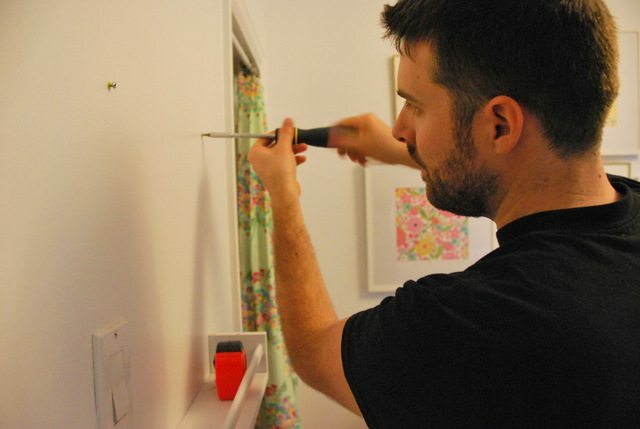 If you can mount into studs in your wall, that’s even better. We couldn’t in our case due to placement, but they have been totally fine for our books. We have a mixture of board and soft cover books in there. Thanks so much for the response!! I appreciate the feedback about how they are holding up. I can’t wait to do this project!!! I believe it was actually a cold air return and didn’t prove to be an issue. The heat vent in that room was on the opposite wall.